On March 2, 2014 our Icons were installed and blessed by Archbishop Sartain. Archbishop Saratin comented that this church really needed this addition of the icons. Pastor Martin Bourke shared that it really looks like a Catholic Church now. We have been so blessed by the generosity of our parishioners to see the vision of what these Icons would bring to the parish. The names of all parishioners who contributed have been written on the back of the icons. St. Charles commissioned Kathy Sievers of Elizabeth the Wonderworker Studio to write these icons for the parish. Icons are based upon Scripture or Tradition. They are not dreamed up. They are not an individual’s idea or ideology. They are Scripture or Tradition in images. At the same time, icons are part of a living tradition, just as God’s Word continues to be revealed in our time. Below is information about the St. Charles icons. Hopefully it will help you understand the basis and meanings for some of the figures. Matthew 28:56 Among them wre Mary Magdalene and Mary the mother of James and Joseph, and the mother of Xebedee's sons. Mark 16:40 There were also women present looking on from a distance. Among them were Mary Magdalene, Mary the mother of James the younger and Joses, and Salome. John 19:25 Mother of God, his mother's sister, Mary, the wife of Clopas, and Mary Magdalene, John the Beloved. Mark 16:39 The centurian who stood guard over him, on seeing the manner of his death, declared, "Clearly this man was the Son of God!" Matthew 28:34 The centurian and his men who were keeping watch over Jesus were terror-stricken at seeing the earthquake and all that was happening and said, "Clearly this was the Son of God!" Luke 24:47 The centurion, upon seeing what had happened, gave glory to God by saying, "Surely this was an innocent man." Note that he is often referred to as Longinus. 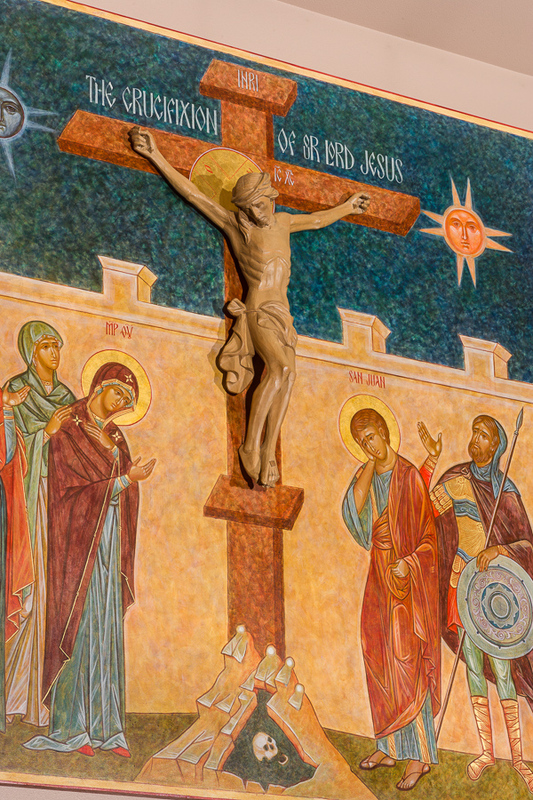 The wall in the icon indicates the wall of Jerusalem, as the Passion occurred outside Jerusalem (John 19:20). Matthew 27:33 Upon arriving at a site called Golgotha (a name which means Skull Place), they gave him a drink of wine flavored with gall, which he tasted but refused to drink. Mark 15:22 When they brought Jesus to the site of Golgotha (which means “Skull Place”),they tried to give him wine drugged with myrrh, but he would not take it. Luke 23:33 When they came to Skull Place, as it was called, they crucified him there, and the criminals as well, one on his right and the other on his left. John 19:17 Jesus was led away, and carrying the cross by himself, went out to what is called the Place of the Skull (in Hebrew, Golgotha). The blue background can represent the heavens or sky, which was darkened. Luke 24:44 “It was now around midday, and darkness came over the whole land until midafternoon, with an eclipse of the sun.”Because of the eclipse, the sun turned dark and the moon is represented in red-orange. The inscriptions in the icon are written in Greek, Latin, English, and Spanish. IC XC: Near Christ’s halo, Greek abbreviation for Iesus Christos, Christ’s human name. Note that above the IC and the XC is the tilde symbol. The use of the tilde in medieval times indicated an abbreviation. This later became the eñe used in Spanish, which was originally indicated with two letter Ns. O: Within Christ’s halo, O, W, and N appear in an inscribed cross within the halo. These three letters are Greek abbreviations for the words God spoke to Moses from the burning bush, “I AM.” They always appear in Christ’s halo (unless gems replace them). These letters, combined with the IC and XC, show both Christ's divinity and humanity, a basic tenent of our faith. Incidentally, the O and the W are both the letter O, but with different pronounciantions, one a hard O sound, and one who. Diacritical marks are used above each. IC and XC, show both Christ’s divinity and humanity, a basic tenet of our faith. Incidentally, the O and the W are both the letter O, but with different pronunciations, one a hard O sound, and one whō. Diacritical marks are used above each. MP OY The abbreviation near the Mother of God (with the tilde or eñe over the top) stands for Mother of God, or the one who bears God. The O has a horizontal line through it, making it an F (replacing the th sound of Theotokos). The Crucifixion of our Lord Jesus: After the battle for use of icons in the 8th and 9th centuries in the East, icons required titles and saints names. The expressions in icons are subtle. Calmness and serenity are present in even the most bleak settings, such as at the Crucifixion. The center Mary gazes at Christ on the cross while she comforts the Mother of God with her right hand. The Mother of God gazes downward, at the same time gesturing toward her crucified son, proclaiming his greatness in this seeming state of degradation. St. John is in a state of grief and loss, yet serene. The centurion is filled with amazement and gestures toward Christ. 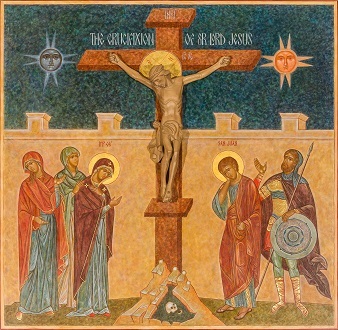 Note that women stand on one side of the cross, and men on the other. At the time of Jesus, women and men were separated frequently, for example in synagogue and during meals. Mary Magdalene gestures toward Christ with one hand. Her other hand gestures outward, leading the viewer’s eye up and around the left top portion of the icon toward the sun and the cross, with Christ at its center. The arms of the cross lead the viewer across the panel to the moon on the right, and down the wall to the soldier and St. John, to the small hill and up the cross, and to the three women on the left. Icons are purposely designed to keep the viewer’s eye slowly traveling around the surface of the painting, drawing the viewer into the mystery represented. This is called dynamic symmetry. The sizes of figures, of the cross, of the wall compared to the height of the icon—all are based upon ancient sacred geometry rules. The three icons and their placement in the church create the framework for the saving action of the Eucharist, which we celebrate together in the liturgy. Blue-green tunic indicating her sharing in the divine. Gold trim of outer garment—garments of ancient times had décor that indicated place of origin of cloth and person. Words were sometimes woven into trim. Mary’s garment includes lettering with the beginning words of the Magnificat, in English on the left and in Spanish on the right. Christ’s inner garment is a warm white. His outer garment is orange with gold highlighting. This garment is referred to as a garment of light. 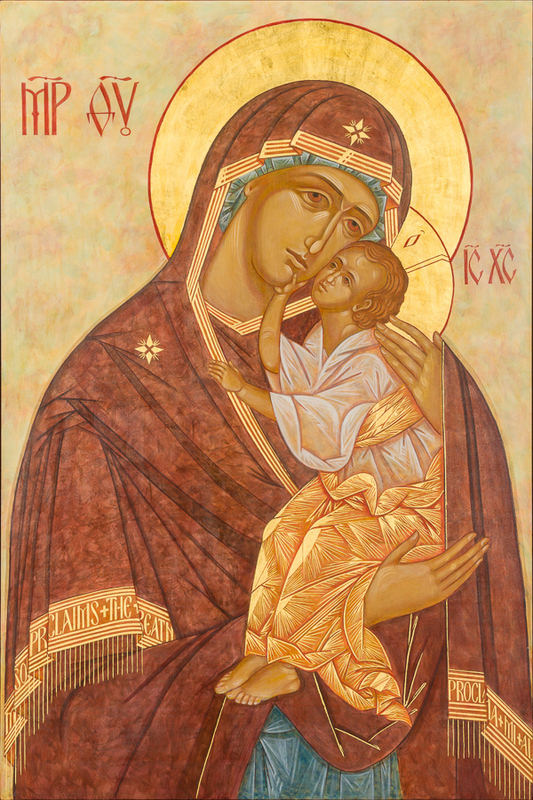 When Mary and Christ embrace closely with her face touching his, it is called a Tenderness type of icon. Mary’s gaze follows the viewer. Each person relates to her embrace and her gaze differently. Her gaze is one of a mother ‘s foresight, seeing what may touch her child. Her gaze is one of tender , and invites the viewer to ponder the mystery of not only motherhood, but of the infant Jesus Christ, the Incarnate God. Joseph is clothed in an earth color outer garment with a blue-green highlight. His inner garment is blue. 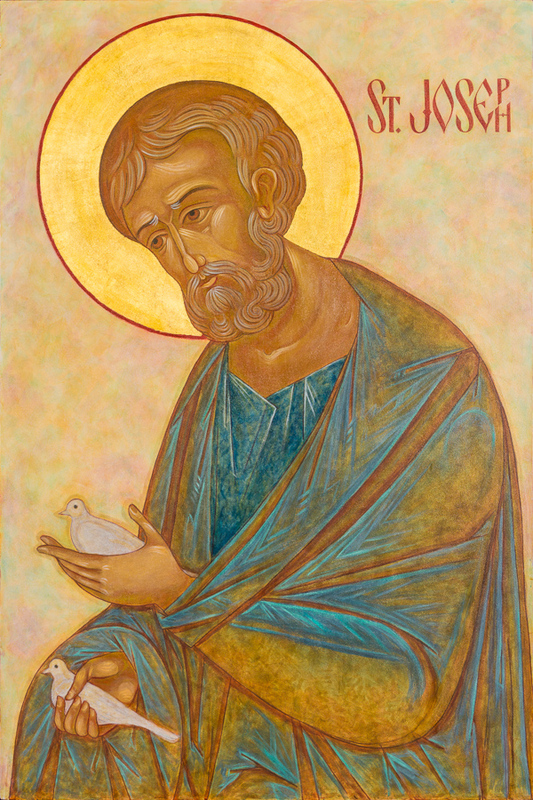 He holds two doves, which he offered at the Presentation of Christ in the temple, Luke 2:24. Joseph is traditionally shown as an older man with gray hair and beard. He is the patron of changes in circumstances. Joseph’s inscription is written using stacked letters at the end (p, h). Thus, when reading Joseph, what is seen first is Jose, the Spanish form of Joseph. Joseph’s gaze is toward Mary and Jesus. He gazes patiently at the mystery of their presence in his life. A view as the icons are displayed in the parish.